Live chat for website is really a jack of all trades, – we are coming to this conclusion as we continue discovering diverse uses of it that can bring immense benefits to every business. Besides its main functions, those of customer service and visitor monitoring, it has also proven to be a great marketing tool. Did you know that by installing live chat on your website you could also benefit your social media marketing campaigns? For those of you who have missed our previous post, we’ve been discussing how to grow your Facebook fans by installing live chat directly to your Facebook page. You can catch up on that post here. Today we would like to share with you a delicious tip on how to add a Facebook social plugin directly to your live chat window, so that users can connect with you as they check in for a chat. There are 3 places in your live chat messenger where you can add a Facebook plugin. And you can actually do all of them: your start chat form, offline form and your post chat survey window. In this post we will be adding their top option, and probably the most popular, the Like Button. The process is incredibly simple and takes less than a minute. Make sure to copy both peaces of code (highlighted in yellow). 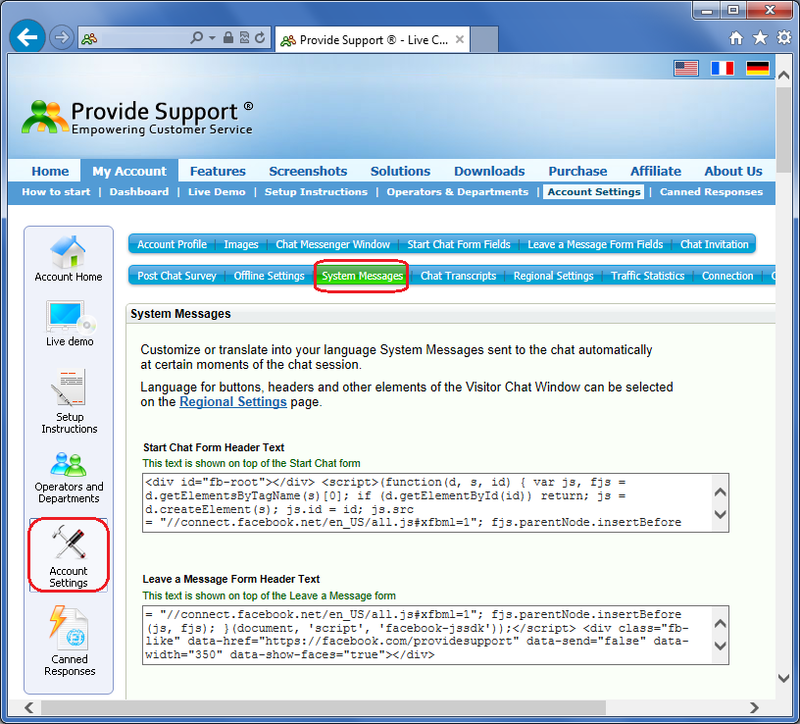 Next, you have to add the codes to one of your live chat System Messages. We’ll break it down in several steps here. Leave a Message Form Header Text field – this will place the Like Button or whichever other option you choose on your Offline Form. We have opted out from showing the profile pictures, but you can choose otherwise. Here the process is similar. First you have to generate the code at https://developers.facebook.com/docs/plugins. After that follow these steps to modify your chat survey files. You will be modifying post-chat-survey-confirmation.html file. You can open it in any HTML editor. The simplest option is Notepad. Right-click post-chat-survey-confirmation.html file, point to Open With option and select Notepad from the context menu. If you experience any difficulties editing or uploading the survey, you may refer to the following article in our manual: Editing the Post Chat Survey, or call our chat support at any time. We hope that you find this information useful, and will continue describing other methods you can use live chat to bring the max value to your business. This entry was posted in Articles, Tips and Tricks, Tutorials and tagged how to add facebook social plugin on chat window, live chat integration with socialmedia. Bookmark the permalink.